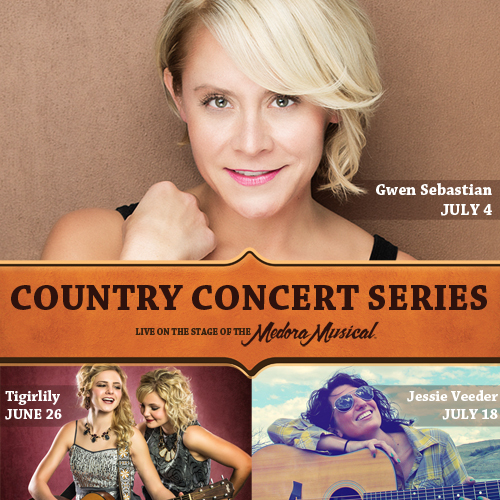 (MEDORA, ND) – North Dakota’s very first “Star of The Voice,” Gwen Sebastian, is set to headline Medora’s first Country Music Concert Series when she takes the stage on July 4. The Hazen duo, Tigirlily, opens the concert series with their performance on June 26 and Watford City native and well-known acoustic artist, Jessie Veeder, will perform a special, full-band concert on July 18. All three concerts take place at 3:30pm MDT prior to that evening’s showing of the Medora Musical, which is celebrating its 50th Anniversary Season all summer long. A social media contest will be held to find one, lucky artist to open for Gwen Sebastian on July 4. Details of that contest will be available at facebook.com/MedoraND.